The Osterreichische Flugzeugfabrik AG(Oeffag) built only 16 D.II aircraft; all subsequent machines represented a D.III modification. The new version kept the D.II's fuselage, tail unit and undercarriage, but its wing construction had undergone development. In fact, the license version retained the original German wing design, but Oeffag's engineers improved the wings' structure, giving them more strength because many German D.IIIs had had wing failures. The D.III (Oeffag) series 53 prototype first flew in February 1917, and in June the first aircraft reached the Front. In comparison with the Hansa Brandenburg D.I, the new fighters were superior in all main aspects of performance (climb, maneuverability); moreover, many pilots regarded the D.III as absolutely safe. Rate of climb was even slightly superior to the German D.III. Armament of D.III (Oeffag) increased up to the two machineguns. 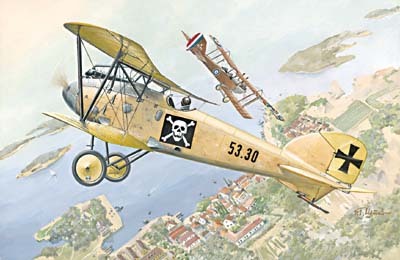 The dimensions of the license-built Albatros D.III also slightly differed from its German "cousin", because of the manufacture and installation of a new engine as well as other details. In all, 45 D.III (Oeffag) series 53 aircraft were built. All of these fighters were dispersed between Front-line and training units. Many of them served until the last days of the war. In the summer of 1917 a new, more powerful engine (200 hp) was installed and this sub-modification, later named the D.III (Oeffag) series 153, with improved performances, replaced the series 53 in production. w/n 53.27, Flik 42J, October 1917; Prosecco airfield; flown by Ferenc Graser (18 victories in total). w/n 53.30, Flik 6F, Spring 1918; Albania, Tirana. Flown by offstv. Julius Arigi (32 aerial victories ). w/n 53.37, Flik 48J, October 1917; Pergine airfield; flown by Josef Kiss (19 victories in total). w/n 53.33, Flik 48D, July 1917; Pergine airfield; flown by fw. Viktor Zimmermann. Later 53.33 flown by Stfw. Julius Kowalczik in Flik 24 based at Pergine. w/n 53.60, Flik 41J, Summer 1917, Sesana airfield; flown by Offstv. Kurt Gruber (11 victories in total). w/n 53.57, Flik 51J, Autumn 1917; St.Veit airfield; flown by Kpl. Eugen Bonsch (16 victories, one - on 53.57).